I had this Mimosa cake recipe in my head for weeks (I found the recipe on this site, Giallo Zafferano, but wanted to do something different with it. So I thought I'd make cute little cupcakes instead of one big cake. More work, honestly, but I think it was worth it. 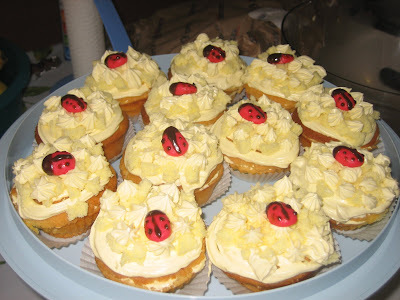 Why ladybirds? Well, in Italy they are symbol of good luck, and then I liked the idea of the yellow and red contrast, and why not, spring atmosphere. Plus, you'll need a 500 g can of pineapple (or other canned fruit, like peaches e.g. ), 200 ml whipping cream, 100 g powdered sugar, and a small glass of Grand Marnier (which I avoided because of the kids. 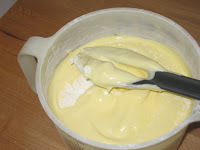 Put the whole eggs, sugar ,vanilla and a pinch of salt in a mixing bowl and beat with an electric mixer until thick and pale (about 10 minutes). Add flour and starch and fold them in gently with a wooden spoon. 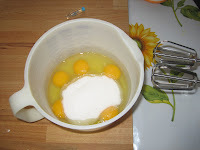 At this point you can pour the batter into a 24 cm round cake form or like me into muffin moulds. 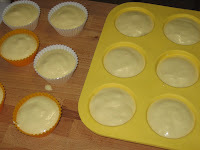 I used sillicone moulds, and greased them only because they were new (just followed the instructions), otherwise if you are using traditional cake / muffin moulds grease them and flour before putting the batter in. 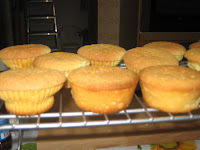 Bake in an oven preheated to 180°C for 20 minutes (for muffins) or 40 minutes (for a cake). Do not open the oven until they are almost done, and do the toothpick check (it must come out clean). Let the cakes cool completely. 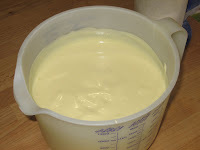 For pastry cream, put 400 ml of milk (leave 100 ml apart) in a pot and add a vanilla bean cut in half lenghtwise. Bring to boil, and then set aside for 10 minutes. In the meantime, beat eggs, sugar and flour until thick. 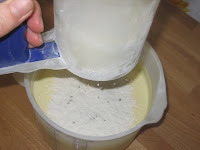 Add 100 ml of cold milk. 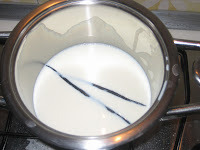 Pour the batter into hot milk (remove the vanilla bean first, I forgot to mention this part, I wouldn't want you to break your teeth), and cook at low heat mixing continuously until the cream is very thick. Let it cool completely, covering with a piece of baking paper or a wet cloth to avoid the "skin" forming in surface. 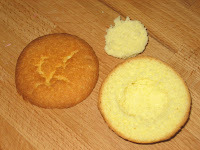 Cut the top of the cakes and remove the center creating a hole. 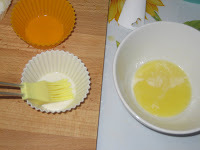 Mix the pineapple syrup with the liquor (or use only syrup like I did) and moisten the inside of the cakes. Fill the hole with the pineapple cream and put the top back. 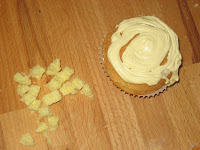 Cut the scooped parts of the cakes into small cubes. Spread some cream on the top and decorate with cubes, so that it looks like mimose flowers.Decorate with the rest of cream. 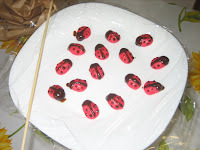 I made these little ladybirds from marzipan, coloured with red colour, and then decorated with melted chocolate. Yay! So looking forward to your blog, can't wait! 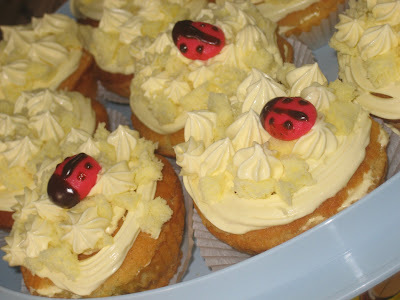 I love the little ladybugs, how cute and springy! Those are ADORABLE Dajana!! They look delicious too...Great job! I love the step by step pictures, it makes the filling part much easier to try for someone (like me) who doesn't do a lot of cake baking! Dajana you're not really right... 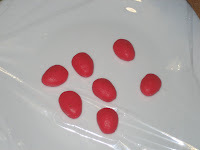 I've tasted the ladybirds... they are not only glad but also very very delicious!!!!!! Well done Dajana go on like this.... I'm Your taster Journal!!! Sorry I forgot to mention my official taster - Simona. you are more than welcome in the bloggers'world...congratulations!!! 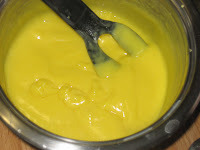 I really enjoyed the recipe and the pictures: they were really extremely clear.Please feel free to write down your remarks on my blog and if you need any translations of our recipes, do not hesitate we will help you!!! These are so cute! I love the lady bugs. And besides being cute they look positively delicious!